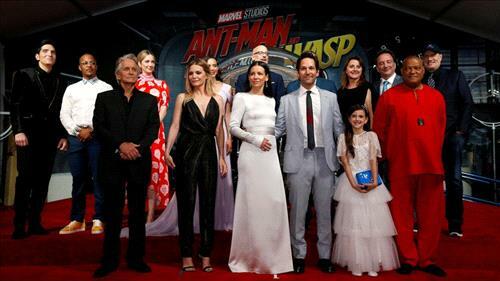 AMMONNEWS - “Ant-Man and the Wasp” squashed the competition at the domestic box office. The Marvel sequel -- starring Paul Rudd and Evangeline Lilly -- opened with $76 million from 4,206 North American locations. That start is significantly ahead of the original “Ant-Man,” which debuted with $57 million in 2015. “Ant-Man and the Wasp” easily topped the weekend, as fellow box office newcomer “The First Purge” scared up $17 million from 3,031 theaters. Meanwhile, “Jurassic World: Fallen Kingdom” just narrowly secured the No. 2 slot for the third week in a row over “Incredibles 2.” The blockbusters earned $28.6 million and $28.3 million respectively this weekend. Praise seems to be even stronger for “Ant-Man and the Wasp,” which holds a promising 86 percent on Rotten Tomatoes. The acclaimed first film came in slightly lower with an 82 percent Rotten Tomatoes average. Universal and Blumhouse's “The First Purge” debuted on Independence Day, getting a head start on the weekend. Its five-day total sits at $31 million. Gerard McMurray directed the $13 million film, which was written and produced by James DeMonaco. The fourth movie in the series serves as an origin story, starring Y'lan Noel, Lex Scott Davis, Joivan Wade, Luna Lauren Velez, and Marisa Tomei. The most recent iteration was 2016's “The Purge: Election Year,” which ended its theatrical run with $79 million domestically and $118.5 million worldwide. “The “Purge” movies have pocketed over $320 million globally. Universal and Amblin Entertainment's “Jurassic World: Fallen Kingdom” recently charged past $1 billion at the worldwide box office. In three weeks, the dinosaur tentpole has earned $333.3 million in North America. Now in its fourth frame, Disney-Pixar's Incredibles 2” just hit a major milestone of its own. Everyone's favorite crime-fighting family has crossed the $500 million mark domestically and $700 million worldwide. It's the first animated film to ever surpass $500 million at the North American box office, and the 12th film ever to do so. Internationally, “Incredibles 2” has made $269 million. Also in the top five is Sony's “Sicario: Day of the Soldado.” The Benicio Del Toro and Josh Brolin-led sequel picked up another $7.6 million, taking the domestic tally to $35 million. At the specialty box office, Roadside Attractions' Whitney” bowed with $1.3 million from 452 locations. The documentary focusing on the life and career of Whitney Houston holds an A CinemaScore and a Rotten Tomatoes average of 90 percent.